The answer may be in a Murphy bed, also known as a wall bed, panel bed, or fold-away bed. Name after inventor William Murphy, the Murphy bed is a fantastic space saver, as it is hinged at one end to store vertically against a wall, or inside a closet or cabinet. The real benefit of this bed is that it allows you to easily convert space in seconds. 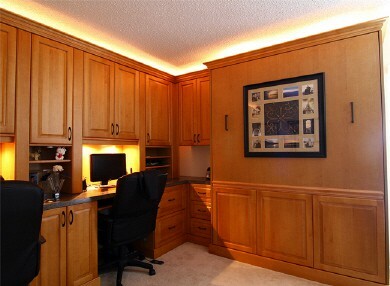 You can tuck the bed away and easily transform a home office into a guest bedroom. 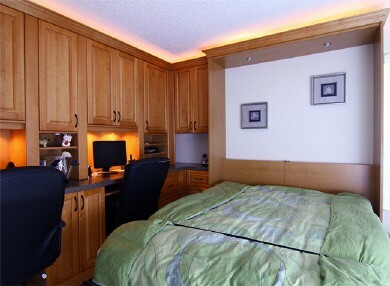 At McCabinet, we specialize in wall beds that are truly unique to the market. Coming in a multitude of finishes to match perfectly with your décor, our wall beds are affectionately called disappearing desks, as when you close the wall bed, the desk surface remains parallel to the floor, meaning you don’t even need to clear off your desk to transform your desk to a bed. You can securely store books, picture frames, laptops, and more. Our disappearing desks are perfect for people with limited space, or people who choose to use a single room for multiple purposes. A customizable wall bed is also a fantastic solution for children’s rooms, as it allows for a large play space during the day and a comfortable bed in the evening. As your child grows into a teen, the wall bed is a perfect solution to allow for a desk for homework and manages to keep your house feeling organized. McCabinet’s wall bed options work within your space and are available in sizes from queen to king. No matter your taste, our wide variety of wall beds will fit your home perfectly. Our award-winning designers can help configure a perfect solution for your space. The furniture look cabinet exterior is customizable to your home, and the patented hinge system makes closing and opening the bed easy enough to do with a single hand. Let the team at McCabinet show you our impressive wall bed options. Schedule an appointment today to speak with our design team about your needs!